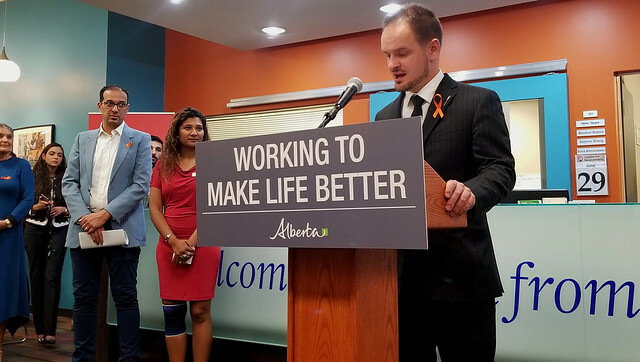 The province is making it easier for newcomers to get a driver’s licence so they can support their families and build a new life in Alberta. Service Alberta Minister Malkinson speaks at the Centre for Newcomers in Calgary. Refugee claimants can now apply and test for a driver’s licence for a one-year term while they wait for the federal government to process their claim. Refugee claimants are allowed to live and work in Canada while they wait for their confirmation hearing with the Immigration and Refugee Board of Canada. In 2012, the previous government changed the rules, making Alberta the only province that barred refugees from applying for a driver’s licence while they waited for their hearing. With this change, Alberta finally joins the rest of country in helping refugees get to work as soon as possible to support themselves and their families. Applicants must undergo the same knowledge and testing process as all other Albertans and must go through the province’s Graduated Driver Licensing program. To apply, refugees must present their work or study permit, refugee claimant documentation and proof of Alberta residency, often a bank statement or utility bill. This change updates previous policy, implemented in 2012, where refugee claimants could not apply for a driver’s licence until their claims were accepted by the Immigration and Refugee Board of Canada. This often meant there were delays for people obtaining services for their families and applying for jobs, making it harder for refugees to settle in their new home. Claiming asylum as a refugee is a legal means of immigration in Canada. According to the United Nations High Commissioner for Refugees, Canada is the second largest resettlement country in the world. In an average year, refugees make up between seven per cent and 14 per cent of all newcomers to Canada. From January 2015 to April 2018, there were 13,670 resettled refugees in Alberta.